1952, 320 pages. Genre : Dystopian Lit. 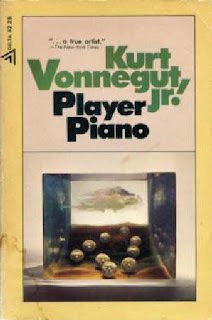 This was Kurt Vonnegut's first pubished novel, and is set in Ilium, New York, where it follows the misadventures of Dr. Paul Proteus in a 1984-esque world. The back-cover blurb on my book calls it as "a cross between Animal Farm and Alice In Wonderland," and that's a fair description. This is "applied dystopia". Whereas Brave New World, Fahrenheit 451, and 1984 all have essentially the same mood, books like Player Piano (satire added) and Animal Farm (um... animals added) at least give the Big Brother story a new ambiance. Also, Vonnegut sticks to a straight chronological timeline here, which is not true in quite a few of his novels. I know chrono-hopping can be confusing to you non-time-travelers out there. Best of all are the characters themselves. The good guys have their faults; the bad guys have their endearing traits. Proteus has few, if any, outstanding qualities. Gray is a nice change from the black-or-white characters in most stories. This is not Vonnegut's best effort. He self-rates it a "B", and I'm inclined to agree. It's a good first stab, but it lacks the polish of his later work. The most glaring weakness is the tired, well-trodden dystopian plot. For an earlier discussion of this, see here. I keep waiting for a book in this genre to come up with something different for a storyline. Anything different. As with any book in this genre, it's fun to see which parts of the future the author got right, and which parts he didn't. For brevity's sake, we'll limit ourselves here to some of his hits. 1.) The Back To Nature Movement. At one point, Proteus decides to "cleanse" himself, and purchases an old farm that doesn't even have electricity. Jaded flower children followed suit 20 years later. With an equal lack of success. Eva Gabor, where are you today? 2.) Let's sing the company song! Thank God, I never had to do this. But it's big over in Japan, and I have a friend who used to work for Wal-Mart, and claims they started every day off by singing the Wal-Mart song. Whatever that is. Oh, and Wal-Mart used to pick a different person each morning to lead the singing. So the trick was to scrunch down behind other patsies to avoid being called upon. 3.) The ultimate anathema. In Player Piano, the label-of-death was being called a saboteur. It didn't matter whether you actually were one or not. Today, of course, we call anyone who doesn't go along with us a terrorist. 4.) Everyone's a doctor. Vonnegut just barely missed on this one. Everyone in the privileged category in Player Piano gets a PhD. Whether it has any use/meaning or not. Nowadays, we don't have garbage collectors; we have sanitation engineers. Secretaries aren't secretaries; they're administrative facilitators. Same sort of thing. Bottom line - this is a good book to read if you're already hooked on Vonnegut ( I am), but Slaughterhouse-5, The Sirens of Titan, or Breakfast of Champions are all better introductions to him. I'm writing a dystopian novel right now, where society is governed quietly by a company who uses its influence through matchmaking. It's sort of a cross between dystopian and tragic-romance. I don't know if that's original at all, but then again, my goal is not necessarily to be original, just to tell the stories in my head. I dont' remember particularly liking Slaughterhouse-5, but it was so long ago, I really should give Vonnegut another chance. Hah! I said that Animal Farm was a dystopian novel, but I was told that it wasn't, because the Soviet Union was really populated by barnyard animals at the time it was written, or something like that. Animal Farm is not a dystopian novel. If you see the Wikipedia article here, you'll see that it's classified as a satire. Dystopian novels are classified as novels which make statements about the future. Animal farm is a representation about the present/past. It is in no way meant to predict anything that will happen, therefore it cannot be considered dystopian. Wow you guys are erudite! (Complimenting.) I was just going to say that I liked the line Hamalcar wrote "I know chrono-hopping can be confusing to you non-time-travelers out there." I'd like to read Amanda's dystopian novel. Sounds interesting - a spin from match.com and all those? You know, I hadn't thought about it that way, Trixie, but I suppose that's a valid take on it. I'm not sure I remember anymore where the actual idea came from, I got it over a year ago. I imagine most of it came in a dream, that's how I get a lot of my ideas.